*X-Camo is a unique blend of natural colors that are very similar to that of the early WWII colors, but in a digital pattern. You will see that the X-Camo works in a wide variety of surroundings. This camouflage will hide you better than ANY camouflage on the market. 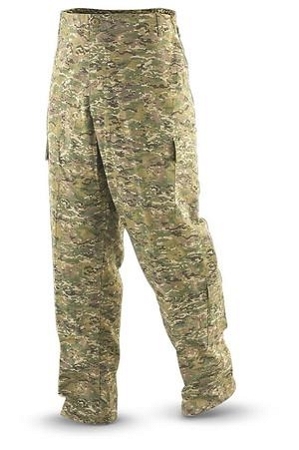 * 60% Cotton, 40% Polyester Rip-Stop * All features made to Military Spec Army Combat Uniform (ACU) *Two forward slant and pleated cargo pockets *Two deep bellowed calf pockets *Reinforced knees and seat for longer lasting pant *Adjustable drawstring waist and leg ties *Total eight pocket construction with double needle felled stitching *Knee pad insert pockets (Knee pads sold separately) *Button fly closure *Vat-dyed **X-CAMO IS A REGISTERED TRADE MARK OF MILITARY OUTDOOR CLOTHING, INC.